Are you searching for a creative gift idea for friends and family on your holiday shopping list? If so, I highly recommend Tukaiz which offers a wide selection of personalized products including cards, notebooks, posters, folders and calendars. Over the past two years, I have given Tukaiz calendars and it is always a hit with the recipient. To celebrate the season, Tukaiz has a ton of great images that can be used to create a personalized calendar or poster using the recipient’s name in creative ways to become part of the actual image. 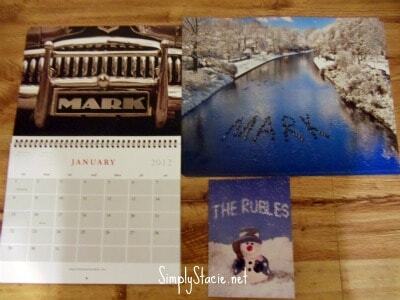 I have found that calendars make a great gift but a personalized calendar really makes a statement. There are two options to choose from at Tukaiz including a 2012 Annual Desk Calendar or a 2012 Annual Wall Calendar. Creating the calendar is simple……just choose your favorite set of images and input the name. Then, sit back and wait for the preview which will feature the name creatively each month. For example, I designed a calendar for my husband, Mark that has his name “engraved” on tools, as a customized grill on a hot rod and emblazed on the side of a motorcycle and a classic car. My “manly man” is really going to flip when he opens this calendar from under our tree this Christmas. There are many different styles to choose from and you are invited to visit the Tukaiz website to check out all of the images and try it out with your favorite name with no obligation. My husband has a poster collection in the garage (he is a printer and has made many of them himself) so I know that he will really appreciate a custom name poster from Tukaiz. In this pretty winter wonderland scene, his name, “Mark” is made out of a duck formation in the water….so cool! There are two poster sizes available including 11’ x 14” and 24” by 36”. The print colors are crisp and clear and I really like the first poster that I created at Tukaiz….I can’t wait to give it to my husband for Christmas too. If you are getting ready to make your holiday greeting cards then you are going to want to check out the images available at Tukaiz. The prices are very affordable and there are lots of images available for the holidays and other special occasions too. The greetings cards are always a very nice quality and a fun twist when the recipient sees that it has been customized. You are invited to visit Tukaiz to browse the full range of products including personalized posters, holiday cards, invitations and post cards. You can even have fun in less than a minute by testing out your favorite name to see how it would look on any of the products or images. Go ahead…..it’s fun!